Superbowl Special Sale-Limited Time Only! 8' Folding Tables, Used/Scratch & Dent (Some tables have scratches & dings, some have chipped edges in spots) While Supplies Last! 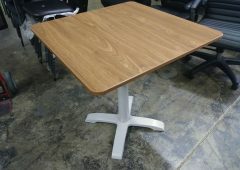 96" x 30" Woodgrain Folding Tables Special Sale Price Available Thursday, Jan 31 ~ Friday, Feb 8 Only! 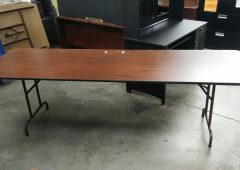 8' Folding Table $ Shop A & M, where you can find Closeouts For Less! Whalen 30" Square Cafe Table in Warm Ash Suitable for use in the home or business Beautiful Warm Ash mid-tone finish X-Base with floor levelers is finished in silver powder coat Top is 11/16" thick Rounded corners make the table safer Dimensions: 30"W x 30"D x 30"H Compare At: $ OUR PRICE: $(In-Box) $(Assembled) Shop A & M, where you can find Closeouts For Less! Clorox Wipes & Lysol Wipes 35 Count Tub: $1.50 -Compare At $2.99 & Up! 75 Count Tub: $2.75 -Compare At $5.49 & Up! Bleach-free, premoistened wipes clean and disinfect in one step; kill 99.9% of bacteria, including staph and salmonella. Ideal for day care centers, offices, schools and restaurants.